Is it a goal worth having? And if we do try to become enlightened (the process of waking up to our true nature) what might that even look like? Yoga is magic, no doubt. And when I say magic I’m not thinking corridors of mirrors or rabbits out of hats, these are more akin to illusion, right? But magic as in… beyond definition, potent for transformational shifts in perception. And we’re talking about the kind of transformations that move us away from illusion and closer to the realisation of our eternal unchanging nature and interconnectedness with all that is. We may go from thinking we know something about ourselves or the way the world works to all of a sudden dropping in to a deeper knowing, as if a shroud is lifted from our eyes. These kinds of shifts are incredibly hard to describe, but you know when you experience them because they create a little groove in your life path. The memories may continue to hum through us… deep, juicy and soul shaking beyond explanation. Sometimes there is laughter and sometimes there are tears as energy moves to release and usher us through the gates of transformation. Last week… I had the pleasure of joining a co-working space (finally out of the home office, yay!) and on my first day I spoke with a man whose eyes lit up when I mentioned I was a yoga teacher. He beamed and said “wow, I just love yoga, it makes me feel so… so… happy!” I got goosebumps. We beamed at each other, sharing a knowing of yoga’s potent magic to so tenderly remove the shroud over our hearts and offer the gift of pure joy. This week… a technician called Anand came to our home about 9pm to fix my husband’s computer. It’s hard to describe what happened exactly but we laughed (a lot!) talked about yoga mostly and he brought Tom’s computer back from the dead. He told me the one thing he does every day is practice anulom vilom (alternate nostril breath) because it makes him happy. After he left there was a still palpable energy in the air, the oxytocin rush of connection, of joy, of having touched on something greater than the sum of us, something… magic! Trying to describe the indescribable is very difficult but as you can tell, I am giving it a red-hot go. I am struck by how intentional I can be about practicing yoga and yet still feel disconnected, then other times yoga’s magic can surface when I least expect it, in the most ordinary moments and have a lasting and powerful effect. Samadhi / Enlightenment has long felt like such a loaded concept for me. For years I had discount myself from the possibility of ever being enlightened because I know I am so flawed, such a worldly jumble of humanness! I thought enlightenment was only for the most dedicated yogis and monks. But have I ever touched the magic of a profound sense of connection with all that is, absolutely. Do I stay consciously established in absolute reality, connected to my immoral soul, Atman, always? Far from it. 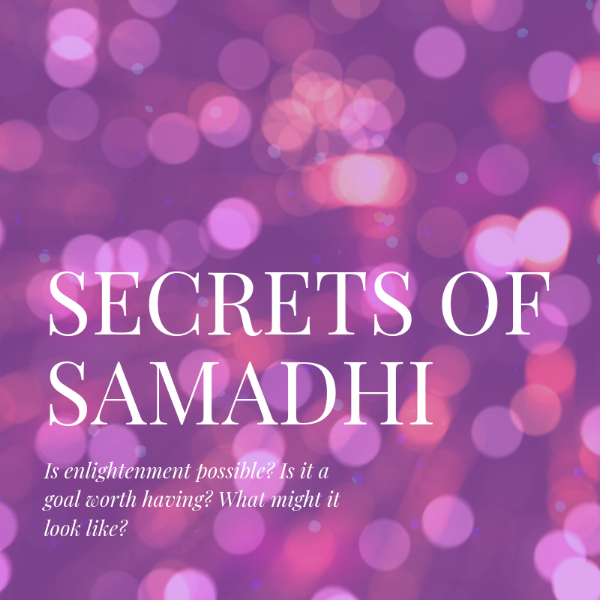 What makes the concept of Samadhi more accessible for me now? The idea that all I need to do actually is be deeply present, connect to my heart, here in this body, on this earth. Sometimes enlightenment is presented as an “up and out” experience”, I prefer going in and down… deeply in to the body rather than attempting to “transcend” it. That said, tapping in to Samadhi feels like less of a ‘doing’ and more of an ‘undoing’. Of showing up to practice (abhyasa) again and again, whilst letting go again and again (vairagya) of the ego’s firm grip on the the temporary realities of senses, thoughts and feelings. That, and basking in a deep reverence of the magic of life and all that is (we might also call this God). 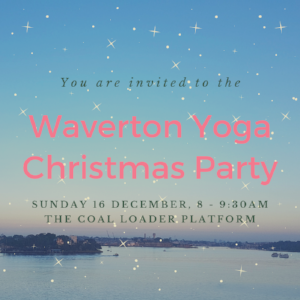 In December we will embark on an exploration Samadhi at Waverton Yoga. We’ll move through awareness of our senses and what pleasures or distractions arise and dissolve on this plane. We’ll intend to tap into an awareness of ourselves as spirit, as energy unchanging, divine in human form; moving, breathing and allowing the pure magic of life, living us with purpose and meaning, to flow.